The Central Eastern Region encompasses New South Wales and the ACT. We have well over 100 Members who are supported by volunteers committed to projects to help the sick, poor and suffering in our community. If you have any questions about the activities of the NSW Branch or would like to learn about how you can get involved please email info@smom.org.au or call 02 9331 8477. Interested in becoming a volunteer? Visit our Parramatta or Sydney Van pages. Founded by the Sisters of Charity in 1886, St Joseph’s Hospital provides services and support to sick and aged residents in the local and wider community of Auburn and Western Sydney. St Joseph’s has 81 beds dedicated to medical and aged care rehabilitation, palliative care and aged care psychiatry. It treats both inpatients and outpatients. The NSW branch is committed to providing support the palliative care unit which benefits not only patients but their carers and families. Each year we provide medical aid and equipment to the hospital that the normal health budgets would not cover, including morphine pumps and refurbishment of the family and quiet rooms for the palliative care unit. Drinking from the Waters of Faith– designed for Postulants in their probationary year and is based essentially on the “Membership in the Order of Malta: Regulations and Commentary” of 2011. Gorman House is part of St Vincent’s Hospital Alcohol and Drug Clinic and provides shelter to some of Sydney’s most marginalised and problematic population suffering from severe alcohol and drug addiction. It consistently operates at full capacity and admits more than 1,500 people each year. Demand continues to outstrip supply – for every person admitted, another is turned away due to lack of beds. Since 2006, the Central East Region (formerly the NSW Branch) of the Order has financially supported the unit, which has provided a social non-medically supervised model of withdrawal management. In addition, Order Members and volunteers have further supported the unit in the form of thrice weekly BBQs to socialise with residents over this difficult period. In 2017 Gorman House became a medically supervised detoxification unit that is now fully funded by NSW Health. The value and need for this service was recognised after over 10 years of commitment and support from Order of Malta members, volunteers and donors who had raised over $1.8 million to ensure the doors remained open 24/7, 365 days a year. Patient and community needs have changed dramatically over the years and the unit was redesigned in 2016. In February 2017, the new Gorman Unit reopened and now provides specialised medical care for people requiring withdrawal management. The new Gorman Unit has 20 beds and experienced and dedicated medical, nursing and allied health staff. The unit provides holistic care including withdrawal management, stabilisation, ongoing treatment planning and post discharge follow up for patients. The Order of Malta’s Central Eastern Region has committed to continuing its volunteer support of the Unit and the Drug, Alcohol and Homeless outreach support services, including the Community Care Vans programme. The volunteer BBQ’s, that were moved to Tierney House (a residential unit assisting the inner city homeless population to access health care) during the closure of Gorman House now continue weekly following Tierney House’s residents and staff wish to see them continue. The weekly BBQ’s are serviced by the members and volunteers of the Central Eastern Region of the Order. The Coats for the homeless project began over 10 years ago, when a Member of the Order in NSW, who was volunteering at a homeless shelter, recognised a need amongst the homeless community who were sleeping rough. Through a consultation process with the homeless, he designed, manufactured and distributed the “Homeless Coat”. Since that time, the project has grown significantly and it is now a Nationwide project of the Order, with Coats being distributed to the homeless across Australia. In Sydney city alone it is estimated that 800 people are sleeping rough on the streets on any given night. Half of all people who request accomodation from the homeless service system are turned away each day due to lack of beds. This leaves them extremely vulnerable to the cold weather. $100 will buy three specially designed, warm shower-proof coats to those who need them. In 2018, in collaboration with organisations that provide services to the homeless, over 3,000 of our specially designed Coats were distributed across the Region – including in metro and rural NSW and also the ACT, to those ‘sleeping rough’. 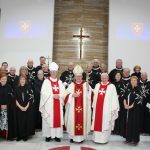 On the first Saturday in December the Order of Malta Central East Region celebrates its Lourdes Day Mass at St Mary’s Cathedral. The annual Mass is open to all, but those who are sick, facing health challenges and wanting good health are particularly encouraged to attend. A Blessing for good health takes place during the celebration of the Liturgy with water brought from the spring at the Shrine of Lourdes. Those receiving the Blessing are also provided with a bottle of Lourdes Water for their personal use. The Grotto at Lourdes, a town in the south western part of France’s Hautes-Pyrenees, has been a popular pilgrimage destination since Mary first appeared there to St Bernadette Soubirous in the mid-19th century. The water from the spring at Lourdes is cherished by the sick and infirmed for its connection to healing miracles. Every year more than six million people make the pilgrimage to Lourdes to drink and bathe in the water, and ask for healing and forgiveness. The Lourdes Day Mass provides those who cannot make the arduous and expensive journey to France with the opportunity to share in the Blessing and the water. 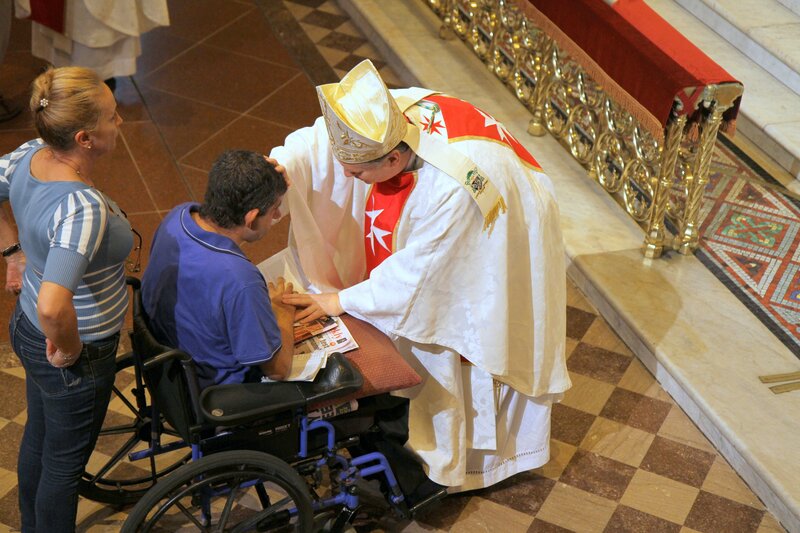 It is a manifestation of the Order’s commitment to fulfil our mission to nurture, witness and protect the faith and serve the poor and the sick representing the Lord. 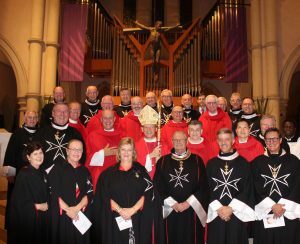 The North-Eastern Region of the Order of Malta Australia generally covers the entire Queensland State and filters out into areas around its borders providing assistance and support to our Lords the poor and sick where ever need. Within the state of Queensland, which encompasses a land mass of 1.853 million km² making it the 2nd largest state in Australia, our Order members number 35 and growing. With so many regional and rural areas in this vast region, providing support to those in need can sometimes be challenging due to the tyranny of distance. At all times we welcome interest in supporting our Order to those seeking to understand the blessing of becoming members, and those looking to assist by becoming volunteers. Without doubt this charitable work is one of the national projects of the Order which has grown over the past decade, and provides a wonderful comfort to those homeless and sleeping rough particularly in the cooler months. 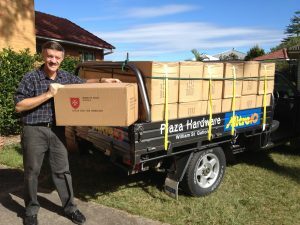 This year our North-Eastern region Queensland members have increased their reach with the Coats for the Homeless program, distributing over 1600 coats to just over 30 separate outlets throughout Queensland. Simon National Carriers provides warehousing and distribution for the entire country, with the exception of New South Wales, and coats are transported throughout the nation in a timely and cost-effective manner by Simon National Carriers for which we are extremely grateful. David Simon, CEO of Simon National Carriers stated “It is our way of contributing to the great works of the Order in assisting those less fortunate than ourselves”. This year’s fundraising for coats held at the Brisbane Club, as has been the case for many years, was hugely successful and the generosity of companies, businesses, parishioners and other organisations has been overwhelming. This initiative continues to strike at the very heart of our Order’s charism and continues to gain tremendous support from the broader community. The Coats for the Homeless Fundraising Breakfast is an annual event at which in excess of over 120 people attend, and is usually held in Brisbane in March each year. 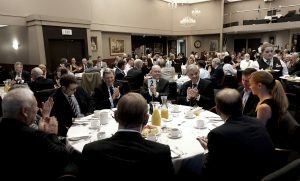 At each breakfast, a guest speaker is invited to share their vision and passion. The generosity of attendees is greatly appreciated and the funds raised are channelled towards the purchase of Coats for the Homeless. The details for the 2019 Fundraising Breakfast are not yet available, however if you would like to attend, email info@smom.org.au with your postal address and we will send you an invitation when they are available. $100 will buy three specially designed, warm shower-proof coats for those who need them. You can donates to the Coats for the Homeless project using our secure Paypal donation facility. Members together with the Young Order of Malta Volunteers have recently developed a program to assemble and distribute much-needed care packages for the homeless men and women together with disadvantaged; a program that involves Member’s participation in the acquisition of product, sorting, packaging and distribution. This charitable works of our Order is a year-round program with especially designed packages sensitive to seasonal change and needs. Thousands of care packs are needed annually and support for the purchase of products is needed and we thank those who continually donate funds and product so that this works can continue into the future. Young Order of Malta Volunteers (YOMV) This growing and exciting area of opportunity for young volunteers to join with members in charitable works and activities is being developed in joint consultation to ensure that the most appropriate and effective structure is put in place. Our region sees this initiative as a key component for the youth within the region to become involved and participate in serving the poor and sick. 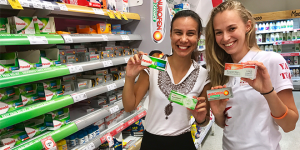 Medicines to Timor: Our region has been truly blessed and fortunate that two of our Young Order of Malta volunteers have been involved in this program since its inception at St Stephen’s Cathedral in Brisbane. More recently our region has undertaken a process of negotiation and discussion with our Young Order members to develop and grow this vital progress and which supplies medicines to Timor-Leste. Once collected these medicines will be coordinated for transport through the North-Eastern region and shipped to Darwin for disbursement through to Timor-Leste. Our annual Healing Mass was celebrated in May with approximately 350 parishioners from throughout south-east Queensland. 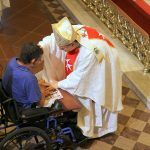 This Mass continues to be one of our Members’ highlights for the year, where we have the opportunity to support the suffering and those afflicted by chronic illness in our community. Members of the Order distribute small bottles of Lourdes water, rosary beads and prayer cards following this special celebration Mass. The Lourdes water is bought over and bottled from the spring at the Grotto at Lourdes, a small town in the south western part of France’s Hautes-Pyrenees. Several clergy, including Chaplains to the Order of Malta, participate in providing a personal blessing for healing and good health during the celebration of the Mass. This active service by Order members is one of the ways in which our Order provides assistance and support in serving our Lords the poor and sick. Visit our Events section detailing upcoming Lourdes Day Mass Celebrations and other Events. Our North-Eastern region of the Order has a long-standing involvement with St Vincent’s Hospital in Brisbane, formally named Mt Olivet hospital, and this involvement can be attributed particularly as a result of the works of our dearly loved late Consoeur Tess Cramond. Her work in the palliative care field in this region was world class, and the legacy of her commitment and dedication lives on. Our Order continues in the provision of funding to assist those chronically ill and dying with the hope of providing a better quality of life. To learn more about our work in Palliative Care or to donate to these projects, please visit our Palliative Care page. Parish Visits: Members and Young Order Volunteers from the North-Eastern Region coordinate Parish visits to selected parishes up to 3 times a year to provide an opportunity for the Order to share its rich history and highlight the charitable works in which it is engaged both regionally, nationally and internationally. Order Mass and meetings: The North-Eastern Region Orders spiritual home is at Saint Paschal’s Wavell Heights in Brisbane, and Magistral Chaplain Father Gerard McMorrow celebrates Mass for members, guests and volunteers 4 times each year which is then followed by a regional meeting and dinner. Spiritual Retreats: An important part of every member’s ongoing faith development. Twice a year for a full day, a spiritual retreat is coordinated with a select spiritual director. These are held at venues throughout south-east Queensland and provide members a wonderful opportunity to spend time, reflect and grow in their faith and commitment so as to further understand more deeply their faith and charisms of the Order. The Coats for the Homeless program is a valuable program especially in Melbourne when winter can be quite bitter as was the case this year. It is well supported by members of the Order. 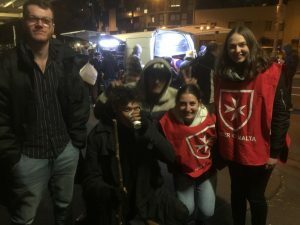 Each weeknight in winter, two members of the Order accompanied by students from Melbourne University’s Newman College, follow the Vinnies food vans to spots where the homeless congregate – generally three stops – and hand coats over personally. This personal contact provides an opportunity to chat with the homeless person, seek to understand his/her situation, offer some words of comfort and show understanding and empathy. Donations to this project can be made using our secure Paypal donation facility. Visit our Coats for the Homeless page. The Lourdes Day Mass is held each year on the first Saturday of December. 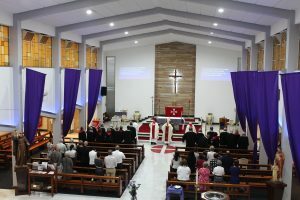 In Victoria, the organisation of the Mass has now taken place for some 15 years and has steadily grown in its attendance. Melbourne’s St Patrick’s Cathedral is full to overflowing with about 2500 people participating. The purpose of this Mass is well understood by Members of the Order – it enables those who, for health or financial reasons, are not able to visit Lourdes to pray to the Virgin for intercession on their behalf. Each attendee, whether ill, aged or a carer is given a “gift pack” which includes the Mass booklet, rosary beads, Lourdes prayer material and a small bottle of Lourdes water. 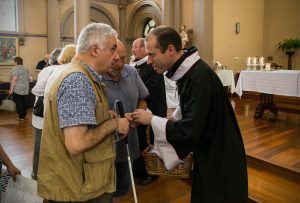 The devotion to Our Lady of those attending, often in wheelchairs, hospital day beads, with walkers, is quite moving and very rewarding for the Members of the Order involved in the Mass’ organisation. 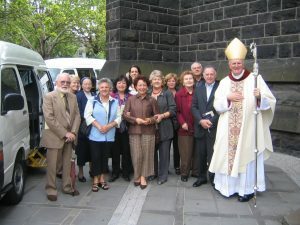 An understated but important activity of the Order is the visitation program undertaken by Members of the Order to prisoners in Victoria’s Barwon prison. This is a monthly program and involves attending Mass with prisoners, sharing a cup of coffee and spending time with them individually. Our members report that very often the prisoners “open up” about their situation as they see in the Member someone “safe” with whom they can confide. 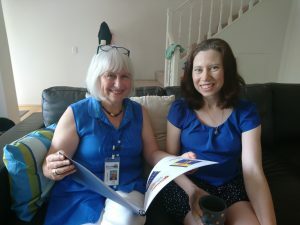 The biography program operates out of Eastern Palliative Care (EPC), a leading provider of palliative care services covering a large area of metropolitan Melbourne, stretching from the inner east (Kew, Hawthorn) to the outer suburban fringes (the Yarra Valley, the Dandenongs). The Order of Malta was instrumental in the creation and development of EPC. In 1992 Caritas Christi and the Order of Malta Hospice Home Care Services Incorporated was formed as a partnership of the Sisters of Charity and the Order of Malta. This homes based service was staffed by nurses, pastoral care and social workers and a core of trained volunteers. In 1997 the two partners became two of three founding partners in Eastern Palliative Care Association Inc.
An important program offered by EPC is its Biography Program. A number of members of the Order volunteer on the Biography Program. This involves a biographer visiting a person in palliative care over a period of 10/12 weeks, to write a brief history of that person’s life. The biography program takes the person’s mind off their condition and gives them tasks (collecting photos, memorabilia, correcting the previous week’s draft, etc) which distract them from their illness. The finished biography is an important legacy (in the form of a written booklet and a CD), which is left with the family and is a record of the person after he/she has died. The social interaction that occurs during the writing of the biography is invaluable. 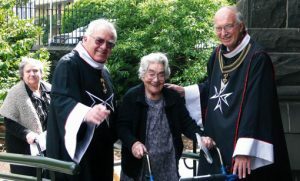 In parallel with the annual Lourdes Day Mass, the Order also organises Masses in Catholic aged care facilities. Currently, this takes place in ten centres spread across metro Melbourne although other centres, having heard about these Masses, are requesting to be added to the Lourdes Mass program and this is being assessed for 2019. The purpose of these Masses is similar to the annual Lourdes Day Mass – it brings Lourdes to them as they are unable to go to Lourdes themselves. Indeed, most of the residents in the aged care centres are physically not even able to attend the annual Lourdes Day Mass. As is the case for those attending the Lourdes Day Mass, each person receives a “gift pack” containing a small bottle of Lourdes water, rosary beads and prayer material. The Lourdes Masses are celebrated by the Order’s chaplains to whom we express our heartfelt thanks for making themselves available for this important program. 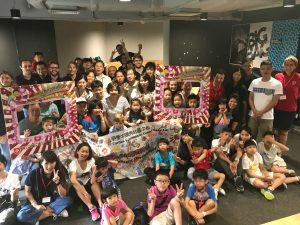 Members, assisted by Year 12 students from Xavier College, tutor children from refugee families who live in the Richmond high-rise Housing Commission flats. Each February, members participate in an annual Lourdes Mass, celebrated at St Francis Xavier’s Cathedral, Adelaide. Members distribute Lourdes water after the Mass and attendees receive a blessing for health. All are welcome to this special celebration. Members also participate in the Adelaide Archdiocese’s annual Marian Procession in May and attend an annual Morning of Reflection each June. 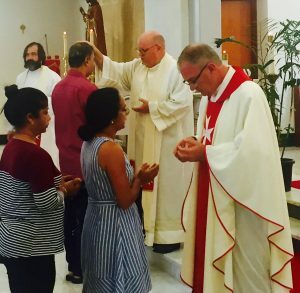 In addition to these celebrations, Members attend regular Masses at the regional meetings, celebrated at Calvary Hospital, North Adelaide, and followed by a meal. The region also hosts an annual retreat at Sevenhill. The project is funded by donations from our Members and supporters and proceeds from fundraising events such as our annual movie night. It is only limited by the funds available. Please consider a donation to Coats for the Homeless to support our distribution. The voluntary work carried out the OM NT Group embodies the twofold charism of the Order – Obsequium Pauperum (Serving the Poor) and Tuitio Fidei (Defence of Faith) – by taking into account the local/regional, national and international issues of poverty and marginalization. Administrative assistance to old, unwell, poorly educated and illiterate, by helping to fill in forms that government agencies require. Social support and encouragement through referral to a formalized network of governmental and Catholic Agencies, such as Centrelink and CatholicCareNT. Submissions to the Northern Territory Legislative Assembly on amendments to legislation and/or bill proposals impacting on sanctity of life, human dignity, and freedom of religion. Coats for the homeless are supplied for the winter months in Alice Springs and Santa Teresa. In addition, blankets and Rosary bead kits are provided. The distribution of the above items is generally coordinated with Fr Raass, the Parish Priest of Our Lady of the Sacred Heart Parish in Alice Springs. This year, a very generous offer from the Central Eastern Region — that has donated to us a further 108 coats for distribution — has allowed reaching with our distribution more needy people in Alice Springs. Father Raass (the Our Lady of the Sacred Heart parish priest, in Alice Springs), Sister Liz Wiemers (the Santa Teresa Parish assistant and coordinator of the Spirituality Centre) and Fr Prakash (the Santa Teresa parish priest) have greatly facilitated the distribution process by providing storage of the goods to be donated. The distribution has been realized both by local volunteers and some members and has targeted predominantly Indigenous People of the Arrernte Community. The Arrernte People are the traditional owners of country east of and around Alice Springs. Alice Springs and Santa Teresa (also known as the Ltyentye Apurte Community, located about 80 kilometers south-east of Alice Springs) are becoming focal points of service for the members of the Central-Northern Region, as many are the issues of sickness, poverty and marginalization to be addressed. 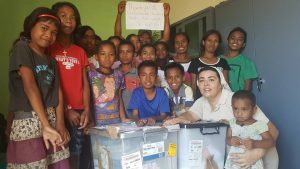 The members of our Region assist the Embassy of the Order of Malta in Timor-Leste with organizing shipments of medicines for use by various religious congregations which run clinics in in Dili and in some rural areas of the country. Logistical assistance is also being given with the medical clinic project in Dili. The assistance consists in providing in Darwin a focal point for deliveries to Dili from various Australian points of origin (the Members have access to several warehousing facilities free of charge) and then organizing shipment to Dili. Our members give their support to the scholarship program ‘Creating Leaders’ by engaging donors and sponsoring some of the students. During monthly meeting, reflections to deepen aspects of our faith are provided by Father Malcolm Fyfe, Chaplain of the Order and Vicar General of the Diocese of Darwin. The Annual Mass of the Order is celebrated in September followed by spiritual retreat. This year, the Mass and retreat have been held on the 8th and 9th of September in Alice Springs, at the Divine Word Missionaries Retreat Centre. The Mass was celebrated by Father Asaeli Raass with the assistance of Father Malcom Fyfe. In 2018, the Catholic advocacy Service made submissions on the Discussion Paper ‘Modernization of Anti-Discrimination Act’- September 2017. They were presented to the Director of Legal Policy Department of the Attorney-General and Justice on the 31st of January 2018. Our member also submits articles for publication in the diocesan magazine ‘Unity’. The Unity magazine is a quarterly publication by the Northern Territory Catholic Diocese. The article published in the June 2018 edition was ‘Faith and equality: balancing religious freedom rights and equality rights in a pluricultural society’. 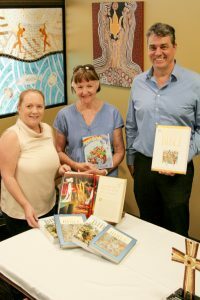 Annually, the members organize the donation of Bibles and Mass books for distribution amongst several Northern Territory primary schools. The distribution is organized in conjunction with the NT Catholic Education Office. Content for this page is coming soon. Please visit again shortly. Founded in 15 April, 2015, Order of Malta Korea (OMK) has developed into a community of over 150 volunteers with 15 invested members and 2 aspirants to date. Silvano Yongmaan Park, now in his second term, has been leading the works of the Order as the founding president and Fr. Mathew Byun has been supporting the members and aspirants on spiritual growth as OMK’s Chaplain. The members and aspirants frequently gather for various projects, the monthly mass and meeting, as well as bi-annual spiritual retreat. The ‘Lunchbox’ project is the first project developed for OMK, which was kicked off on 25 June, 2016 in celebration of St. John’s Day, with an aim to provide decent meal for the poor and the sick residents of slums in downtown Seoul. The project is fully self-funded by the members and aspirants, and has grown over time from once a month to now four times a month with an average of 30 participants per activity where these members and volunteers cook, pack and deliver 300 lunchboxes to the marginalized residents in a slum near Seoul Station. The focus has been improving both the quality and quantity of the lunchbox, where they served over 15,150 nutritious lunchboxes, or monthly average of 600 lunchboxes, through 53 activities as of December 2018. The ‘Bread for Weekend’ project was developed as OMK’s second project, which aims to provide specially baked breads on a weekly basis to the forgotten neighbors who can hardly afford even one meal over the weekend. The Sisters of Mary bakes the nutritious breads at the bakery fully set up by OMK, and the members of OMK pack and deliver them to the forgotten neighbors in the city of Seoul. The first baked breads were consecrated by Father Paul Seong-ryong Bae and Father Bartolomeo Keun Huh on 6 December, 2018 and OMK made the first delivery on 5 January, 2019. The ‘Jacket for Life’ project is OMK’s third project that aims to help the homeless from the freezing cold with a specially designed jacket that has a function of a sleeping bag. This special jacket also has a buckle strap in the wrist for the homeless to carry the jacket easily, ensuring continuous protection wherever they end up spending the night. A total 350 jackets were made for this winter, and the first distribution took place on 10 December, 2018, followed by several distribution services where and when needed throughout the season. 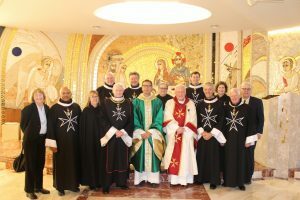 Order of Malta – Hong Kong was established in 2012 as a sub-organization of the Australian Association, with its own locally-elected Council as governing body and independent finances. On 17 October 2018, the Sovereign Council approved the creation of the Hong Kong association. This is the Order of Malta’s 48th national association worldwide, the third in Asia after Singapore and Philippines. The Hong Kong association currently has 23 members, of whom 15 are knights and 8 dames. The President is Denis Chang, Knight of Magistral Grace.